Hello! 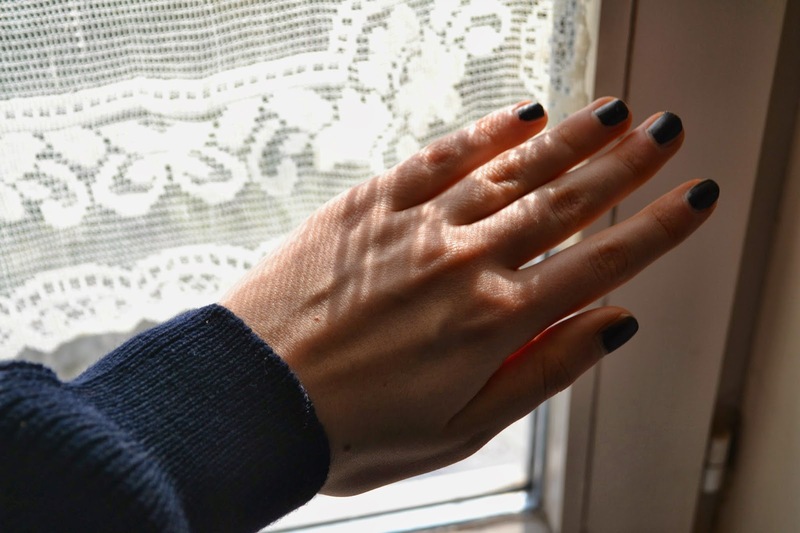 So I am back with a new post after a week of skiing and a week of being ill (that's what you get when you breathe in a hotel). I had so much fun in Italy skiing and eating amazing food and catching up on sleep and tanning (yes I know I don't tan but I enjoy the idea of tanning). But Belgium isn't so bad at the moment either! Spring is finally coming and it is quite sunny. Not that I could enjoy the weather because uhm I was being under it - the weather that is. 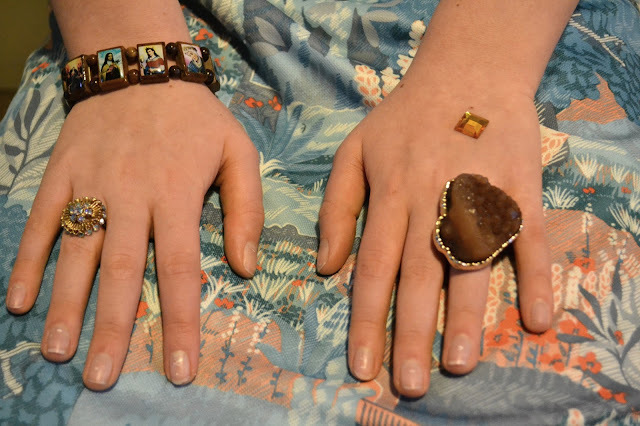 When I finally felt better today I started taking some photos of the jewelry that the really sweet people of Vintage Store sent me. And the lightning in my room was really pretty this morning so yay! 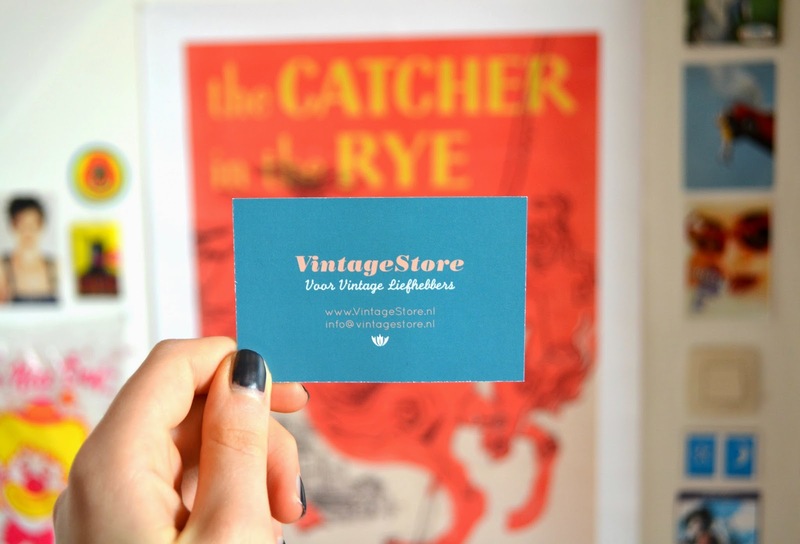 VintageStore's business card (loving the fonts). And in the background you might see my beloved Catcher in the Rye poster which is one of the favorite things in my room. 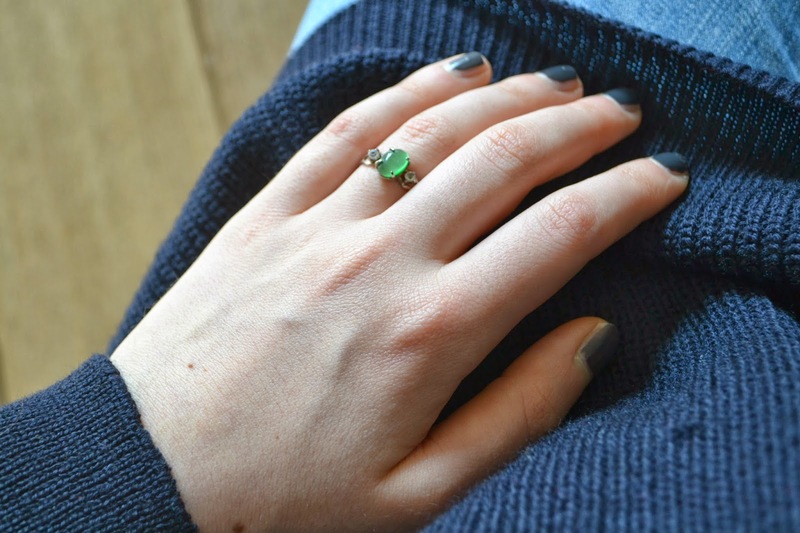 All the items I picked: an 80's ring with a beautiful green stone: I've wanted a pretty stone ring for a long time and I like the fact that it is a light greenish shade because I think it would look cool with an all black outfit and then just a little bit of colour. Next item: a vintage moon broche: In my humble opinion the moon surely is one of the most fascinating objects ever. Space in general and the moon in special. I don't really know why. But what I do know is the NASA moon photos up on my walls have an eerie attraction, that my tumblr is full of moon pictures (and I even have a moon cursor) and that the crescent emoji is my most frequent used emoji. So long story short: I most definitely had to pick this broche. And I absolutely love it! Moving on to the last item: a pair of vintage gold earrings. I have been looking for hoops like this for a while now and I love them but the really tiny delicate ones are still on my wishlist so if anyone knows a place where I can buy them cheap let me know! 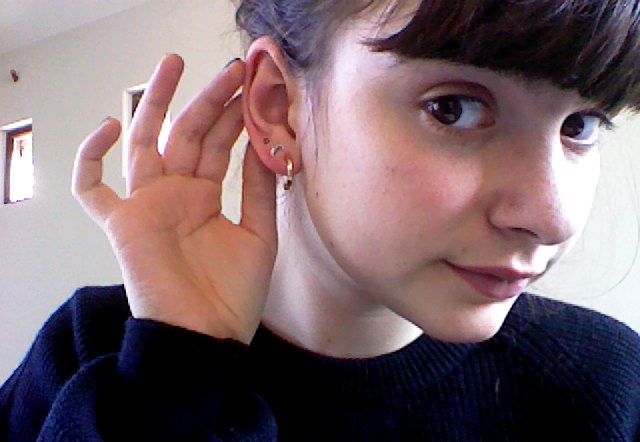 I don't think I've already told you guys that I now have three ear piercings in my left ear. So this is my ear situation right now. Gold hoop that Vintagestore sent me, silver moon earring (see more moon obsessing) is from a really really really weird shop that kind of sells everything and is owned by an even weirder man and the red fake ruby one is the earring that I got my ear pierced with and I kind of like it so I am leaving it in. Oh and the sweater is something I found in a little souvenir shop in the village where we went skiing! It must have been gathering dust there for ages and they gave me a huge reduction on it because it fluffs a little bit. 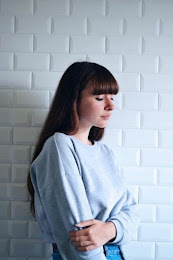 But it is super cozy and a classic navy sweater has been on my wishlist for a long time! Close up of the ring. Look how pretty aaaaah I feel like together with this ring (the one on the left and is it just me or have my hands grown a lot in one year??) it could become my signature ring, because I like wearing at least one ring every day. My babies modeling my new jewelry. 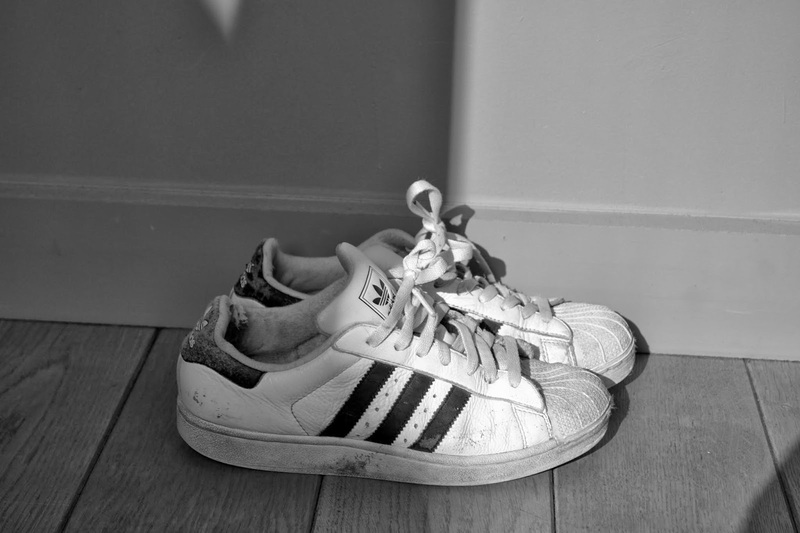 On a different note: I finally got my hands on a pair of classic Adidases. Found them in a secondhand shop for 15 euros! I love how they are already worn in (don't worry I washed them before wearing them) because new sneakers feel so awkward and make me pretty uncomfortable. Oh and before I forget, I wrote a new article for Teenkicks (in Dutch, sorry) about the best Belgian bands You can read it here if you want to. 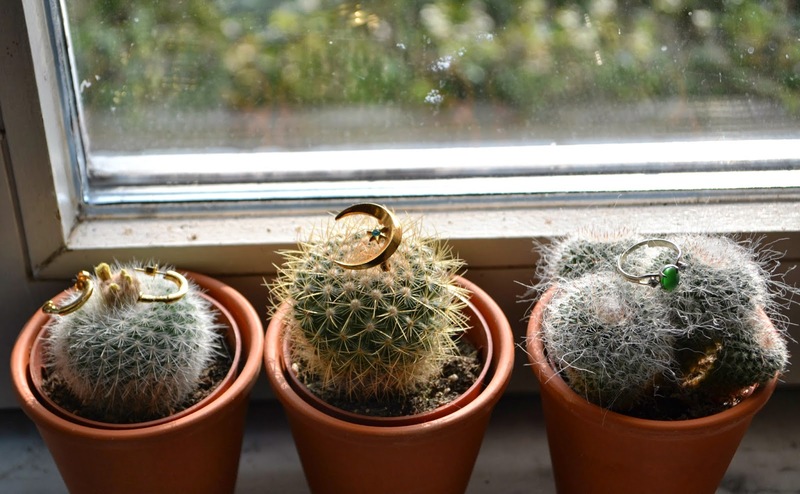 I love the photo of your cacti. They look beautiful in your jewels! Ibe, your jewellery is so lovely! It's really awesome post. Your blog is really useful for me. Keep update your blog. ,Specialities watch for sale,Fast delivery and free shipping! Earrings are looking awesome. 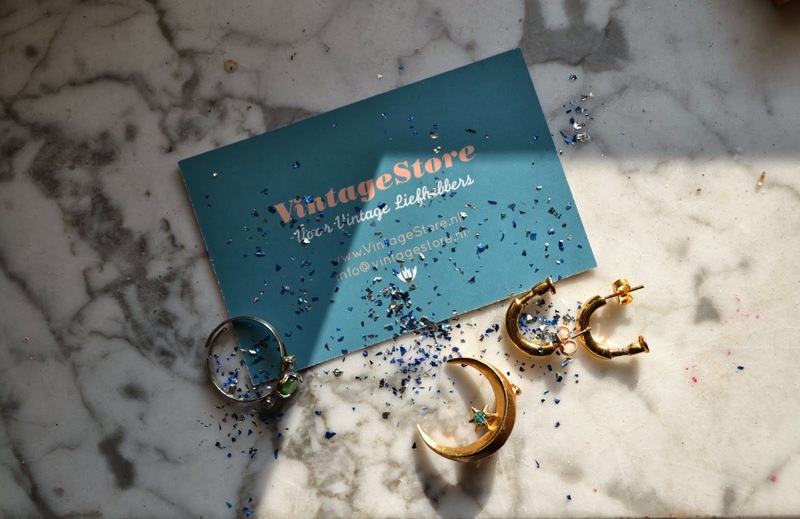 These days Marvelous earrings are found on online-based websites. They are really awesome. And yes its comparable with these. jewelry and watchesJewelry and Watches - Get a Great selection of Jewelry & Watches at affordable prices. Free Shipping to 185 Countries | 45 days money back guarantee and Friendly customer service. Jewelry and Watches - Get a Great selection of Jewelry & Watches at affordable prices. Free Shipping to 185 Countries | 45 days money back guarantee and Friendly customer service.